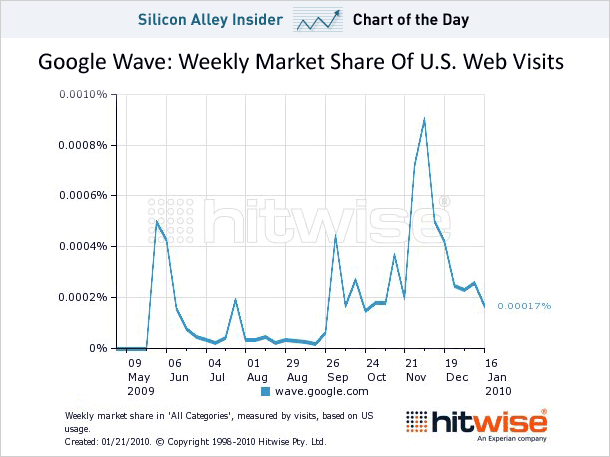 The chart below shows the spectacular adoption failure of Google Wave as a standalone product. This was predicted by a lot of people including myself. As Anil Dash puts it Google Wave does not help solve a "weekend-sized problem". Inseparable container, content, and collaboration: Changing people's behavior is much more difficult than inventing or innovating a killer technology. Most of the people still prefer to keep the collaboration persisted separately from the content or not persisted at all. Single task systems such as email, Wiki, and instant messaging are very effective because they do one and only thing really well without any confusion. Google Wave is a strong container on which Google or others can build collaboration capability but not giving an option to users to keep the content separate from the collaboration leads to confusion and becomes an adoption barrier. Google Buzz certainly seems to solve this problem by piggybacking on existing system that people are already familiar with - email. Google Buzz is an opt-in system where the users can extend and enrich their experience against using a completely different tool. Missing clear value proposition: Google Wave is clearly a swiss knife with the open APIs for the developers to create killer applications. So far the applications that leverages Google Wave components are niche and solve very specific expert system problems. This dilutes the overall value proposition of a standalone tool. Google Buzz is designed to solve a problem in a well-defined "social" category. People are already using other social tools and Google Buzz needs to highlight the value proposition by integrating the social experience in a tool that has very clear value proposition unlike Google Wave which tried to re-create the value proposition. Google Buzz assists users automatically by finding and showing pictures, videos, status updates etc. and does not expect users to go through a lengthy set up process. Lack of a killer native mobile application: This is an obvious one. Google Wave does work on iPhone and on some other phones but it is not native and the experience is clunky at best. When you develop a new tool how about actually leveraging a mobile platform rather than simple porting it. A phone gives you a lot more beyond a simple operating system to run your application on. Google recognized this and Google Buzz is going to be mobile-enabled from day one that leverages location-awareness amongst other things. I hope that the mobile experience is not same as the web experience and actually makes people want to use it on the phone. You could argue that why Google Buzz is going to be different since Google did have a chocolate box variety tools before Google Buzz - Latitude, Profile, Gmail, Wave and so on. I believe that it is all about the right experience that matches the consumers' needs in their preferred environment and not a piece of technology that solves a standalone problem. If done right Google Buzz does have potential to give Facebook, Twitter, Foursquare, and Gowalla run for money. 0 Response to "Google Buzz Is New Black - Solving A Problem That Google Wave Could Not"